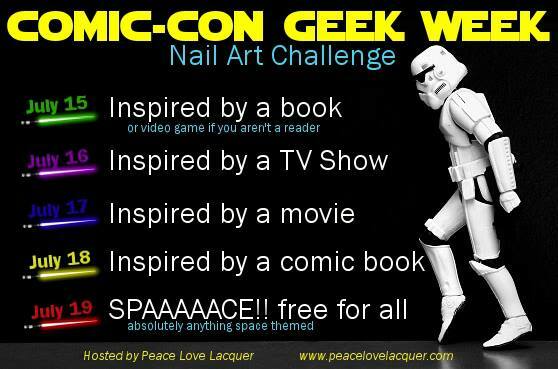 Galactic Lacquer: Comic-Con Geek Week - SPAAAAACE! Today wraps up the Comic-Con Geek Week challenge! Today's theme is SPAAAAACE, which means that it's a free for all for anything space related. Well since I didn't choose Star Wars for "inspired by a movie" day, I thought I should do something Star Wars related today! I guess it's not as blatantly space related as galaxy nails or space ships, but I chose to do characters from the Star Wars movies. For each nail, I painted a stormtrooper, Boba Fett's helmet, R2-D2, and Chewbacca. 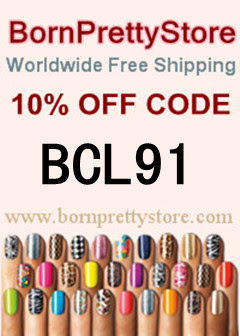 I thought they were all pretty iconic, and also very colorful for interesting nail art! I started by painting the stormtrooper nail and the R2-D2 nail with China Glaze White on White, the Boba Fett nail with Sinful Colors Envy, and the Chewbacca nail with Revlon Hot for Chocolate. I then dipped my wet nail that had Hot for Chocolate on it into the brown flocking powder to made Chewbacca's nail fuzzy. I used the same flocking powder for some Chewbacca nails once before. For the other nails, I just free handed the designs again! I used nail art polishes in silver, red, yellow, black, brown, and blue. I think the designs turned out alright. My stormtrooper looks a bit off, but oh well. And the green started to show through the red on Boba Fett's helmet as it dried, but I don't mind since it makes it look more battle scarred! This whole nail art challenge was really fun! I haven't really done any nail art in a long time, so it was great to get back into it. I'll be participating in more challenges like this in the near future! See how the others wrapped up the Geek Week challenge! LOVE IT!!! and chewbacca is AMAZING. Great job!